This entry was posted in Christianity, Encouragement, spiritual growth and tagged action, Holy Spirit, love, persistence, prayer, running shoes, seeking God. Bookmark the permalink. Love that image, raised some black swallowtail butterflies last year. God’s love is heard and felt in the words you write. Blessings to you, sweet Terra. Thank you Terra, this was so good! We must seek first the kingdom of God and His righteousness, and those things we need will be added unto us. We must pursue the Lord with all of our hearts, and with our very beings. One thing about the Lord, is that He is not going to play hide and seek with us. 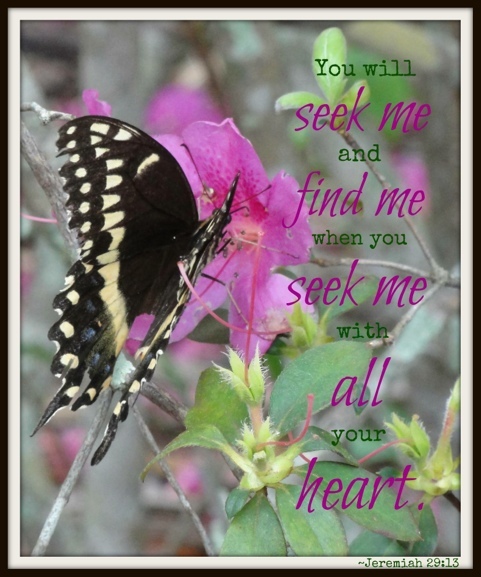 When we seek Him, He will make Himself available to us, very readily! I enjoyed your post! May the Lord bless you! Amen! Thank you Sister. Glad you enjoyed it. God is good.